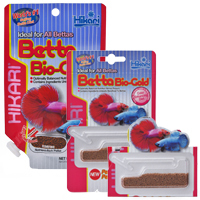 Hikari® Betta Bio-Gold® has been developed after considerable research into the eating habits and nutritional requirements of bettas. This floating pellet has been carefully balanced to meet the nutritional needs of your pet. The inclusion of premium-select fish meal which provides a superior protein source, Astaxanthin which helps enhances coloration, Grape Seed Extract (polyphenol) which has been shown to reduce the impacts of aging and Spirulina which naturally offers a high concentration of usable vitamins make this a daily diet perfectly suited for bettas and their high stress nature. Look for our other premium diets which your betta will also enjoy; Micro Wafers™, Bio-Pure® Frozen Blood Worms and Bio- Pure® FD Freeze Dried Blood Worms. Developed, produced and packaged in our facilities so we can be assured you’ll always get the ®Hikari quality you expect!